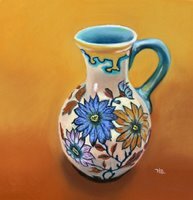 This hand painted vase was originally my grandmother’s in Holland. It’s actually a pitcher but all 3 generations have used it as a vase. I have more around the house and plan on painting them also.